This news was revealed today by the Solomon Islands Football Federation (SIFF) in a statement from the general secretary, Eddie Ngava, this afternoon. 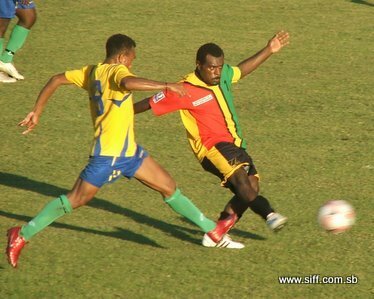 Ngava says that SIFF has been working behind the scenes to strengthen the preparations of the Bonitos and the confirmation from Vanuatu is a result of negotiations with the Vanuatu Football Federation (VFF) the week before. “We have had several talks for friendly matches with our neighbours and the confirmation from Vanuatu is welcome news for us. The Bonitos team has been working hard and they will look forward to the test matches that we have planned,” Ngava says. Initial discussions with VFF started in Zurich but it took some time before an agreement could be made. The confirmation that Vanuatu will be part of the home and away friendly matches came in an email received today. The friendly matches will be played in Honiara and in Port Vila and will be timed with the respective independence days of Solomon Islands and Vanuatu. The games in Honiara will be on 5 and 7 July while the return matches in Port Vila will be on 27 and 30. SIFF is also pursuing the possibility of the organising other matches with teams in the region and has set its focus on Fiji and Papua New Guinea. Last year SIFF also pursued similar test matches with its neighbours but no teams were able to confirm their availability. However, the proximity of the Pacific Games is expected by SIFF to smoothen its negotiations with its neighbours. Other teams in the region are also gearing up their preparations for the Pacific Games which also serves as the first stage qualifiers for the FIFA 2014 World Cup in Brazil. The top 3 finishers will qualify for the second round of the qualifiers in a pool that will include New Zealand. The fight at the Pacific Games, thus, will be a tougher affair as this level of exclusivity is envied by all the participating countries. Solomon Islands finished fourth in the last competition and there is a renewed push for the Bonitos to take the country into the second stage. This is marked by the early calling of the team in 2010 and preparations that have spanned more than 1 year already. Several developments are also underway which will boost the preparations of the Bonitos. The most prominent of all are the current discussions that are underway for a coach from Brazil to work with the national team. SIFF is still sorting out the details with the government and is hoping for a confirmation of their commitment to the arrangement. Solomon Islands best finish as the Pacific Games was a silver in the 1994 competition which was held in Papua New Guinea. Noel Wagapu, was the coach of the national team at that time. The current coach of the national team is Jacob Moli.